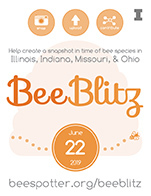 Join us on Saturday, June 22, 2019 for the fifth annual BeeBlitz! BeeSpotter is a partnership between citizen-scientists and the professional science community designed to educate the public about pollinators by engaging them in a data collection effort of importance to the nation. It is a web-based portal at the University of Illinois for learning about honey bees and bumble bees and for contributing data to a nationwide effort to collect baseline information on population status of these insects. We are currently only collecting Bee Spottings in the states of Illinois, Indiana, Missouri, and Ohio, but hope to eventually expand to other states as well! Please be sure to post at least one photo with each submission! The expert identifier cannot respond to any ID request that does not have a photo. We receive queries from people wondering how they can get involved in this initiative. The best way to get involved is to get out there with your camera and capture some good pictures of bees! We want to get a better idea of bee demographics, and we can't do it without your help. We are currently able to identify bee photos from Illinois, Missouri, Ohio (added in 2015), and Indiana (added in 2017). In order to get your bee pictures on our website, just create an account and then add your bee spotting.